Restore your Smile with Dental Implants in Springfield, IL! A missing tooth or missing teeth can profoundly impact your confidence and make it difficult to enjoy the foods that you love. If you’re missing multiple teeth or an entire arch of teeth, dentures can provide an alternative to having gaps in your teeth or living with diseased teeth, but they can present many problems, including poor fit, changes in speech and difficulty chewing. Fixed bridges are usually the go-to procedure if you’re just missing a single tooth, but often require alteration to adjacent healthy teeth. At Milner Dentistry, we have helped many people in Springfield, IL with dental implants that remain in place permanently and do not pose the problems that are common with dentures or bridges. · Dental Implant Post – This part of the tooth implant resembles a tiny screw. The dental implant post is made of titanium so it can integrate with your jawbone through a process called osseointegration. For the dental implant procedure, the dental implant post is surgically placed and the patient is allowed several months to heal so the implant is stable before the dental implant crown is attached. · Abutment – After the dental implant post has fused with the jawbone, a dental implant dentist will attach a custom abutment to the post. 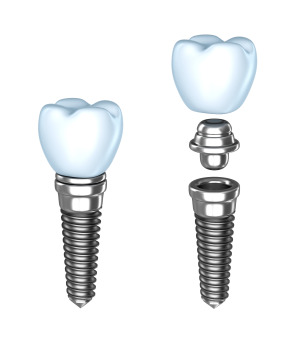 The abutment is a small metal cap that connects the dental implant crown to the dental implant post. · Tooth Restoration – The tooth restoration is the dental implant crown that attaches to the post. The restoration is usually made of porcelain and is formed to match the color and shape of your surrounding teeth. Patients that are missing multiple teeth can choose to have an implant-supported dental bridge or dentures instead of multiple dental implant crowns. Our Springfield dental office is also happy to offer mini dental implants to patients who are missing several or all of their teeth. Mini dental implants are primarily used to anchor and permanently stabilize dentures to completely restore your smile; however they can also work as single replacements for missing teeth. Dr. Milner can place mini-implant rod and abutment, as well as the crown (if needed, in the one office visit. Mini dental implants are more cost-effective and require less healing time than traditional dental implants. For more information on mini-implants, please visit our mini dental implants procedures page. · To replace one or more missing teeth without affecting adjacent teeth. · Dental implants can sometimes resolve joint pain or bite problems caused by teeth shifting into missing tooth space. · To restore a patient’s confident smile. · To restore normal chewing, speech, and digestion. · To restore or enhance facial tissues. · To support a bridge or denture, making them more secure and comfortable. · If you need to replace missing teeth or a single tooth, implants are a stable, permanent solution. What Should I Look for in a Dentist if I’m Considering Dental Implants in Springfield, IL? When you are considering dentists to place implants, you'll want to find a practice that combines thorough, quality patient care with advanced technology. At Milner Dentistry, we do a complete evaluation on the health of the mouth before we even discuss implants. If we notice signs of gum disease, we focus on first treating the condition in order to provide a healthy, stable foundation for the implants. Dentists who are willing to forgo this step and place implants when there are signs of gum disease run the risk of implants failing or not lasting for long. Drs. David Milner and Ty Milner make use of sophisticated technology when placing dental implants in order to ensure best results. We use digital sensors for our oral x-rays and perform panoramic x-rays to give us a full view of the mouth, which is valuable for treatment planning. This digital imaging technology also allows our team to fully discuss the treatment plan with you so that you understand what steps will be taken to place your implants. Our goal is to give you as much as information as possible to help you make the best decision when it comes to restoring the appearance and functionality of your mouth. Questions about Dental Implants? Ready for a Dental Implant Consultation in Springfield? If you have questions about dental implants, or if you would like to request a dental implant consultation, please contact us. We look forward to helping restore your smile!